This article describes the inner structure and organization of the elements which build the RadDropDownList control. StackLayoutElement: Serves as a container element defining a stack layout. 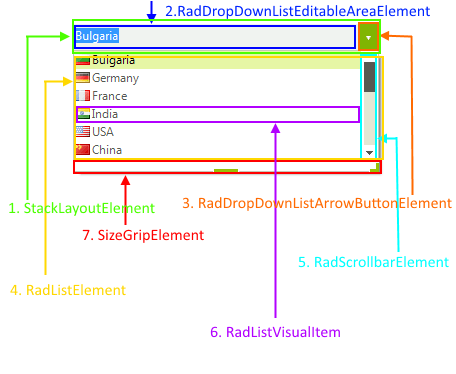 RadDropDownListEditableAreaElement: Contains a RadDropDownTextBoxElement responsible for handling user input. RadListElement: Parent element containing the populated items and the scroll bar. RadScrollbarElement: Scrolls through the items. RadListVisualItem: Visual representation of the populated RadListDataItem. SizeGripElement: Resizes the drop down element.